Best Herbal Remedies & Natural Treatment for Perimenopausal / Pre Menopause Symptoms. Menopause Women typically think of menopause as the stage of life when their menstrual cycles completely stop. But in truth, women's health begins to change many years earlier, which often brings its own set of discomforts and challenges. The four to six years before menopause are called perimenopause or pre-menopause, which is a time of transition that begins anywhere from the late thirties to early fifties. The definition of menopause applies after 12 consecutive months of missed periods. Although not all women will experience the exact same set of symptoms during perimenopause, many common symptoms can occur. Natural Assets' Formula for Women features well researched herbs & nutrients that help reduce the symptoms of perimenopause. Click here for more information. Taking a wellness-oriented approach to balance the mind and body can help ease some of the discomforts of perimenopause. Although the mainstream medical community may offer sleeping pills, antidepressants and artificial hormones, many women like to avoid these options and prefer more natural options. Many of the choices recommended for healthy lifestyles in general can also make a difference in dealing with the discomforts of perimenopause. Getting regular exercise, getting adequate sleep every night and eating a healthy, balanced diet can provide natural menopause relief. Establishing a habit of regular meditation or journaling can also help with reducing stress. By managing your stress, you also reduce your levels of cortisol, the hormone associated with stress that leads to abdominal weight gain. Natural remedies for menopause can provide a great deal of symptom relief, although you should check with your doctor or healthcare provider to make sure herbal treatments are appropriate for you. As with conventional medicine, herbal medicines can have side effects and risks as well as benefits. Dong Quai (Agelica sinensis) is a Chinese plant, the root of which is used to make medicine. 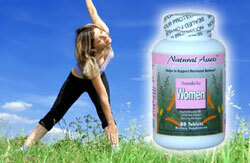 It is believed to balance estrogen levels. What might be the Cause of Night Sweats?